Addressing a joint press meet with Russian President Vladimir Putin, PM Modi said today was a new chapter in India-Russia ties. Brushing aside the threat of American sanctions, India on Friday signed the much-anticipated S-400 long range surface-to-air missile defence system deal with Russia that is expected to bolster the defence preparedness of the country. “India and Russia welcomed the conclusion of the contract for the supply of the S-400 long range surface-to-air missile system to India. Both the sides reaffirmed their commitment to enhance military-technical cooperation,” a joint statement of the two leaders said on Friday. The S-400 missile system, manufactured by Almaz-Antey, is capable of tracking and destroying hostile strategic bombers, jets, missiles and drones at a range of 380 km. The bonhomie between the two leaders was very much in evidence as Modi welcomed the Russian leader with a hug before the two leaders went into a restricted meeting followed by delegation-level talks at the majestic Hyderabad House. 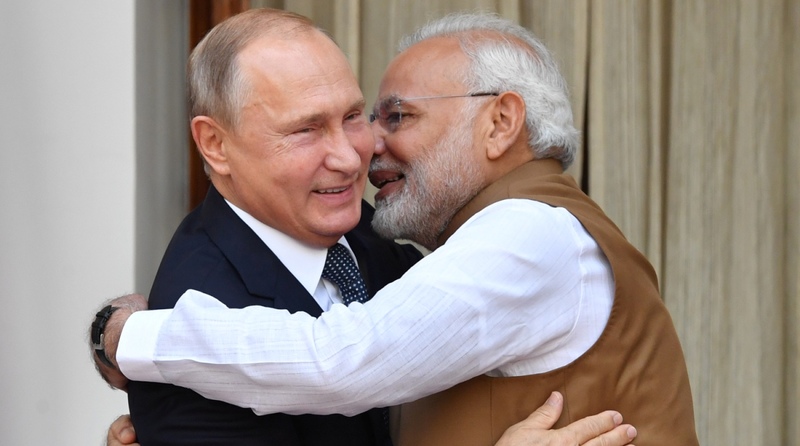 As the two leaders addressed the media after the summit, there was confusion on whether the S-400 missile deal, seen as the showpiece of India-Russia defence partnership, had been signed or not in view of US threat of punitive action against Indian entities dealing with Russia under the Countering of America’s Adversaries Through Sanctions Act (CAATSA). Neither Modi nor Putin mentioned the deal in their statements to the media. The deal was also not inked at the agreement-signing ceremony in the presence of the two leaders as is the practice. However, officials later privately told the media that the deal was signed just before Modi and Putin went into their summit-level talks. India has been negotiating the missile deal with Russia for three years now. America’s threat of sanctions, however, did impact the progress of negotiations between India and Russia. India had last month firmly told the US at the ‘2+2’ dialogue that it takes note of the historic nature of India-Russia defence relationship as also legacy issues and keep the missile deal out of the sanctions’ regime. Apart from the mega defence deal, the two countries inked as many as eight major agreements in areas like nuclear energy, railways, trade, transport, education, human spaceflight programme and small-and-medium enterprises after the 19th India-Russia annual summit between Prime Minister Narendra Modi and Russian President Vladimir Putin. A crucial MoU was signed between Indian Space Research Organization (ISRO) and the Federal Space Agency of Russia ROSCOSMOS’ on joint activities in the field of human spaceflight programme Gaganyaan. An Indian monitoring station will be built near the Russian city of Novosibirsk in Siberia, it said. Eight agreements were also signed between the two sides at the end of the talks. Addressing a joint press meet with Russian President Vladimir Putin, PM Modi said, today was a new chapter in India-Russia ties. Hailing the country, the prime minister said Russia has played a big role in India’s story. “India gives priority to its relations with Russia. Russia has always been a part of India’s growth story,” PM Modi said. “Our countries have mutual benefits in supporting struggle against terrorism, Afghanistan and Indo-Pacific events, climate change, organisations like SCO, BRICS, G20 and ASEAN. We have agreed to continue cooperation to these international organisations,” PM added. Russian President Vladimer Putin in his speech said India and Russia enjoy a relationship of mutual interest. He further said the two leaders discussed about the situation that has cropped up as a result of the decision of the United States to withdraw from the Iran nuclear deal. Welcoming Indian firms to invest in Russia, Putin said the two nations share longstanding ties. Putin also invited Prime Minister Narendra Modi to attend the Vladivostok Forum as the main guest. Vladivostok Forum also known as the Eastern Economic Forum was set up for the purpose of encouraging foreign investment in the Russian Far East. PM Modi received Putin at the Hyderabad House and the two leaders warmly shook hands and hugged each other obliging cameramen. Russian President Vladimir Putin who arrived in New Delhi on Thursday is accompanied by a high-level delegation comprising Deputy Prime Minister Yuri Borisov, Foreign Minister Sergey Lavrov and Trade and Industry Minister Denis Manturov among others during his two-day visit. The US had earlier urged its allies to forgo transactions with Russia, warning that the S-400 missile defence system that India intends to buy would be a “focus area” for it to implement punitive sanctions against a nation undertaking “significant” business deals with the Russians. India had already given indications that it will go ahead with the deal notwithstanding the US sanctions.